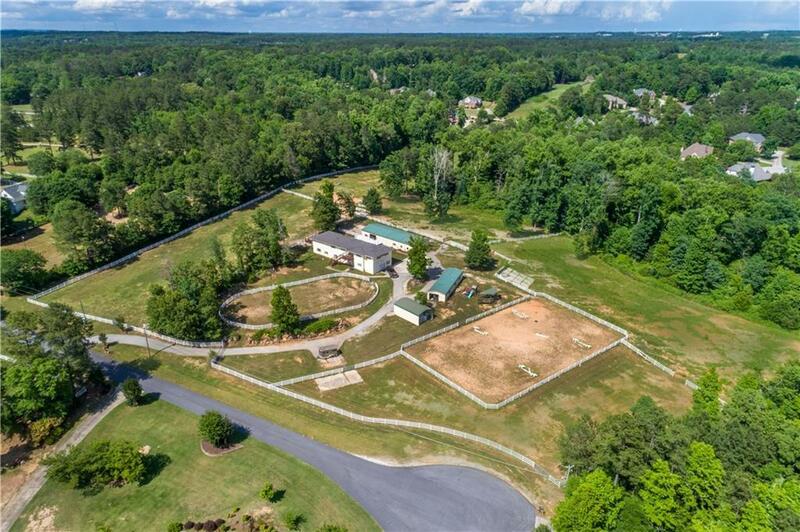 Ranch home with a turnkey horse training/boarding facility located on 11.25 acres. Two arenas, one is lighted. River sand footing. Fenced w/water in all pastures and paddocks. It has a 8 stall heated/cooled insulated barn w/2 foaling stalls, matted, concrete aisle, half bath, hot/cold wash rack auto fly system. The 2nd barn has 4 stalls and a tack room. Shavings shed/implement shed. There is a riding/event trail around the perimeter. The homes features 5BR's and 3 1/2 BA's, 2 living areas and a dining room with ceramic and hardwood floors throughout. Directions: From I 20 East Bound Exit West Avenue. Turn Right And Continue Straight On Klondike To Left On Flat Shoals To Right On Smyrna Road. Left On Smyrna Ridge Court- Marked As Private Road. No Sign. Selling Office: Algin Realty, Inc.